In the heart of Trastevere, a ten minute walk from St. Peter, five minutes from Santa Maria in Trastevere and, across the Ponte Mazzini or bridge Sisto, now to Campo dei Fiori, Pantheon and Piazza Navona. The apartment is located in a closed-end street bounded from Hanover and at the foot of the Gianicolo. 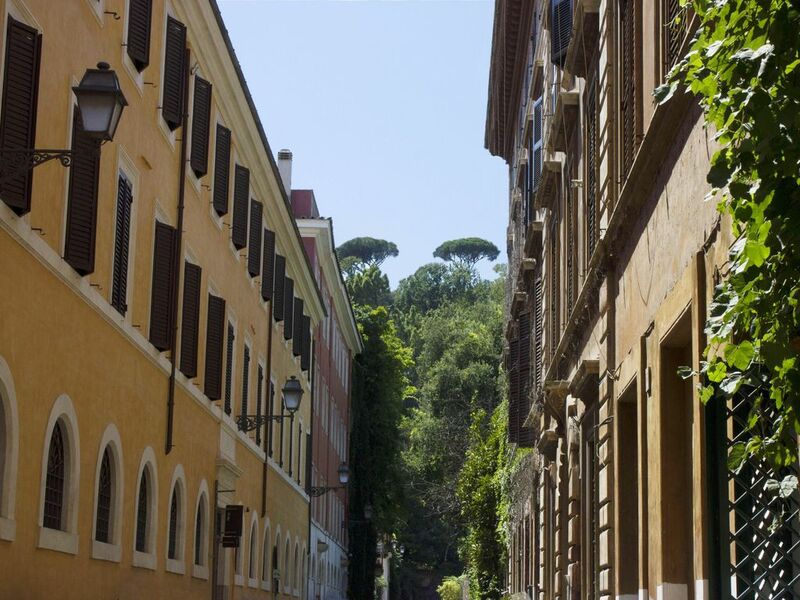 This way the Romans residents is considered one of the most beautiful streets of the city for the fifth green that is the background of the road as soon as you take from Via Lungara; in fact immediately it opens a curtain as the background scenery for a play. The block was built in 800 by Cardinal Riario, from which the street is named. Was conceived, initially, as a hospital, but later, at the beginning of the century, it was decommissioned and interior spaces divided into civil dwelling apartments that have, even now, the characteristic of being all different from each other. Since there are only ten apartments the building is very quiet; in front there is a convent and to the sides the botanical garden and so, despite being in the center, you can enjoy much tranquility, despite the proximity to a range of delicious and attractive premises such as restaurants, pubs and shops in the neighborhood where especially the night life is very lively. In Rome like notoriously small hours and so it seems almost forget the rest with some newspaper kiosks open even at night. The apartment is furnished with antiques, since the time before the house was inhabited for many years by its owners that only after the transfer in Tuscany make available, from time to time, for guests on holiday. After many years of living in the midst of the Tuscan countryside, from time to time I crave museums, movies and good shops. Even though distance-wise I am closer to Florence, I prefer heading to Rome for my citybreaks. I like Rome because is my home town. Here I attended the Art College; that's why I love any kind of Art. I love Rome for its nightlife, no risk of finding restaurants closed at 10 pm. My favourit interests are: tea, wine, cinema, my pets, gardens, books, museums and Rome. Travelling with my partner and my two teenage children (15 & 18) we were met by Luisa at the door as we unloaded the taxi, she had arranged the taxi to bring us from the airport. She was a lovely lady who enthusiastically told us about the workings of the apartment, as well as how to access the roof top space. Then she went off, but we had her contact number if we needed it. for any reason. The temperature was very high in the mid to high 30's every day so the aircon was very welcome! Also the roof top was a great place to have a drink at the end of the day when the temperature dropped a bit! We would certainly recommend this apartment to anyone who is looking for a central but peaceful 2 bedroom apartment in Rome. Hopefully we will be back at sometime. Accueil chaleureux de la part de Luisa dans son appartement typique de Rome, confortable et très joliment décoré; nous avons passé un séjour mémorable dans ce lieu dépaysant, charmant et si intéressant ! L'appartement est idéalement situé pour visiter Rome à pied. Un grand merci à Luisa! "Appartement comprenant un salon confortable, deux grandes chambres doubles, une cuisine bien équipée et une salle de bains. Trés bien meublé. Ambiance familiale. Trés calme. A deux pas du centre de Rome qui peut donc être aisément visité à pied. Restaurants et commerces à proximité. Tout pour assurer un agréable séjour. Accés compliqué en voiture à cause des sens interdits. Bien préparer l'itinéraire. En un mot : hautement recommandable"
"Excellent accueil de nos hôtes Luisa et Giuseppe.C'est un très bel appartement, décoré avec beaucoup de goût, ambiance romaine et chaleureuse. Deux très belles chambres, joli séjour et salle à manger. L'appartement est situé dans une rue calme du quartier Trastevere et à proximité des cafés et restaurants. Unlieu idéal pour partir découvrir Rome et se reposer au retour. À conseiller pour votre prochain séjour. Arrivederci Roma"
From Termini station take bus No. 64 or 40 and get off at Chiesa Nuova, Corso Vittorio.